Erin is a fine artist working in Bethlehem, Pennsylvania. 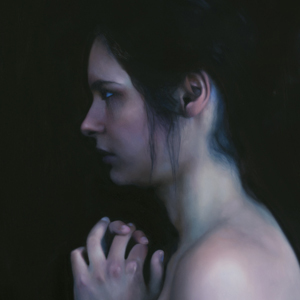 The focus of her work is centered upon portraiture and depicting the human figure. More specifically, her interests lie in the emotional nature of human dynamics, both internal and interpersonal while simultaneously exploring the duality of spirituality and consciousness throughout the course of people's everyday lives and interactions. In her words, "Life ebbs and flows with many floating through our days oblivious to our own connections to the world. It's only in retrospect that the synchronicity becomes apparent. Emotion, energy and connectivity are central themes in my work. The idea that an emotion felt by an individual can also be felt by those around them, whether directly or indirectly, is a captivating concept to me. Someone can go through life interacting with others oblivious to the invisible dance that is the energy they exude and the way it is received. Visually exploring this idea of emotion felt through energy and the ensuing dynamics in individuals and groups is the basis from which my work stems."